Glue guns have been used for years for arts and craft projects. The challenge with working with hot glue is that it is easy to get burned or to have a flood of hot glue that must be dealt with quickly. 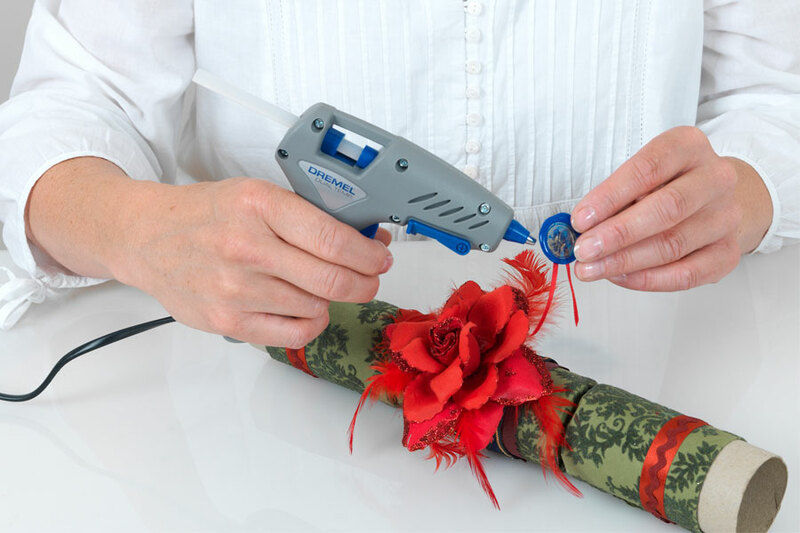 Better quality glue guns offer precise glue applications and no mess guns. We have selected the best glue guns on the market that will provide even flows and easier application for all your gluing needs. The 3M-Scotch-Weld-Hot-Melt-Applicator is operated with the use of a trigger. This makes for easy application of the specific amount of glue desired. The lightweight design is very easy to use and easy to store. The contoured grip is built for comfort and provides excellent and exact control over where the liquid glue is placed. The 3M-Scotch-Weld-Hot-Melt-Applicator fits ½ inch glue sticks which are readily available in craft stores. Scotch makes glue sticks for their glue guns as well. The Scotch Weld AE sticks are ½ inch by 12 inches in size. This glue gun must be plugged in. It heats up quickly and is ready to use in minutes. The gun will provide smooth application of the melted glue for whatever project you have. 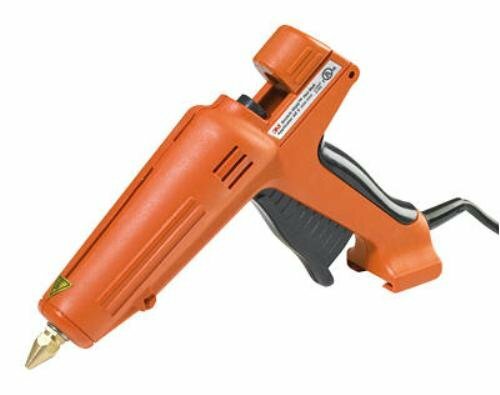 The Stanley-GR20K-Trigger-Feed-Melt glue gun offers a trigger application. This allows the user to control the flow of the hot glue to precise amounts. The Stanley-GR20K-Trigger-Feed-Melt has a fast heat up time and bonds materials in less than 60 seconds. It will bond to nearly any material, from fabric, plastic, glass to wood, making it very useful for many projects and household applications. This glue gum uses standard glue sticks that can be found in any local craft store. 12 glue sticks are included with the kit giving you everything you need to get started. 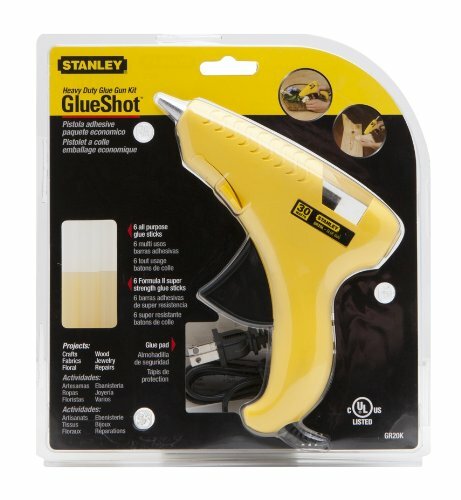 The Stanley glue gun is perfect for arts and crafts and will provide reliable performance use after use. The glue gun only weighs 1 pound and comes with a limited lifetime warranty. 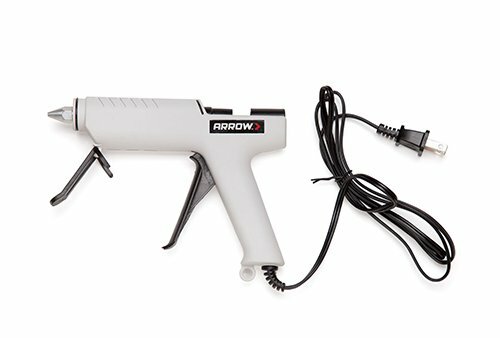 The Arrow-TR550-Lever-Feed-Glue gun is a heavy duty gun that has a lot of convenient features that makes it easier to. The nozzle is a non-drip design, allowing you to work without dripping glue into other surfaces. It also has a built in stand with a drip tray which will hold the glue gun upright while you work. The drip tray will capture any residual glue that is left on the tip after application. The heavy duty cord is 6 feet long and the circuitry is built to last. There is exact control over the glue volume enabling you to make precise gluing for intricate projects. The melting chamber has a high temperature to create an even flow and fast heat up. The trigger application and comfort grip makes the glue gun easy to use. The Arrow-TR550-Lever-Feed-Glue is a professional grade gun. It comes with a storage box for storing both the gun and additional glue sticks. The gun has a clutch design that will prevent glue from backing up into the glue gun.